One of the most striking and realistic pub signs I have ever seen. And probably the most surreal. Deceptively simple, but arranging the colours took ages. I have decided to make some cradle quilts with 100 squares and piece the tops with my 100 year old Singer 99K to celebrate its centenary. I have had to put images of 100 year old babies out of my mind and content myself with the fact that a baby could celebrate 100 days at a little over three months. I have had these lovely pinks and greens for a while and have been waiting for the right project to use them. ...especially on the back with the rabbits. ... look, no frills! Not much progress since last week, but enough to know that trying thermal curtain lining for landscapes was indeed a good idea. Not that I am in the landscape frame of mind. The weather has been such rubbish that I was considering doing a study in grey, but today I thought I would have a go at an industrial scene, complete with jerry-built chimneys. Definitely a sketch and not the real thing. The post in Week 77 that really caught my eye was Maartje's experiments with thread, especially this feather quilted in metallic thread. If you haven't seen her blog post yet, nip over now and see more photos. Now here's a sight to gladden the heart! ... and finally a bit of fun, with the emphasis on speed rather than direction. Will she be a free motion quilter or a cartographer? Looks like the coast of Cyprus to me. I am told that Miss H means business and her first project is going to be a bag. Many thanks to Elizabeth for the wonderful photos! Another picture taken in Salamanca last year. Solutions can present themselves to you when you least expect it. This is the predictable picture for this week - yet another tea cosy, still using up the colourful prints. The black with white spots makes this one look a bit heavy. I was toying with the idea of using one of the spotty fabrics for the binding, but took the lazy way out because I had a length of navy blue floral print binding left over from an earlier project. I think all the different fabrics are fighting a bit, but teamed up with my daughter's Where's Wally mug there is scope for a very bright and cheerful and slightly riotous tea break. While I have been making tea cosies I have been mulling over landscapes, and the other day I had a flash of inspiration. 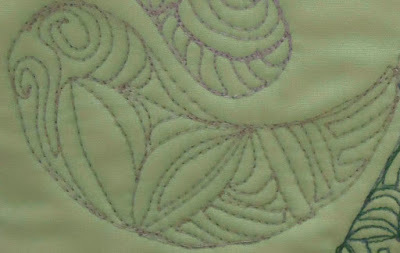 One of the irritating problems when quilting closely packed lines is that the edges end up frilly. Worse still, you can end up with tiny little pleats appearing in the fabric, and you just have to quilt over them. It was while sorting out the lining for this tea cosy that the obvious hit me. Why don't I use the same stuff for landscapes? So here is today's experiment. Instead of sewing on calico, I have started a test piece using thermal curtain lining for both the front and back. There is no need to add wadding, because this curtain lining has a fused fluffy backing, so the wadding is inbuilt. It is stiff, so I am hoping that frills might be a thing of the past. The project in Week 76 that really caught my eye was Bernie's baby quilt, made using orphan blocks she had found in a shop, with sweet little FMQ birds in the centre. If you haven't seen her blog post yet, nip over now and see more photos. Sometimes when flitting around charity shops you have to buy something instantly because you knew it was there waiting for you. This fascinating wooden box, approximately four inches by five and a half, was paid for in a trice. Probably it was originally a cigarette or cheroot box, but now it has bobbins in it. The lid has a picture on it, embossed in metal, of a couple in their finery. The candle and the huge bed suggests that it is their wedding night. I would love to be able to identify the costume. On checking one of my books, I found that the lady's outfit is very like the costume from Georgia, but I have had less luck with the man's outfit. My knowledge of the Caucasus is very limited. Now that is the sort of dancing I could cope with. Low energy, gliding around looking superior, because you know you look totally and utterly fabulous. I'm not so sure I could pull it off at my age, but my daughter could. Especially welcoming when you know what is inside. Welcome to Remnant Quilter, the latest follower - thank you for joining! Now for something completely different. This wall hanging is totally unlike anything I have ever made before, because most of the work was done by somebody else. This is how I started, with this unfinished piece of embroidery. 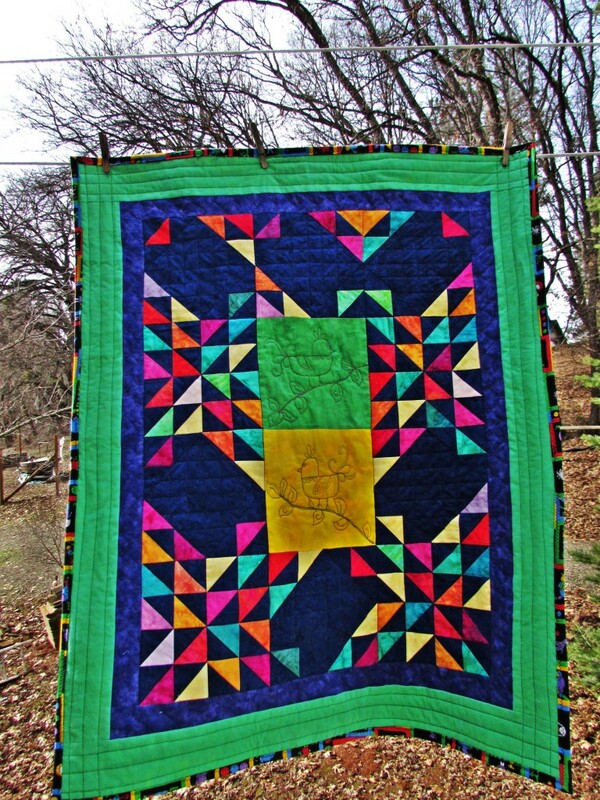 It had been lurking in my cupboard for nearly five years, so I got it out last month and made the quilt sandwich. However, the broad inner border was finished, the printed design worked over in silk embroidery thread, which has a marvellous sheen. It was tacked to a calico backing and the embroidery worked through both layers. At the outset the centre looked relatively empty, so I got busy on my wonderful 1945 Singer 15K treadle and did the free motion quilting to outline the printed design. I added a few beads for a bit of twinkle once everything else was finished. In the two blank corners of the centre I put free motion quilted leaves and berries, and later sewed on beads in shades of blue and pink. After quilting the centre, I outlined all the embroidery with free motion quilting. Going round all the little clusters of French knots was fun. I was afraid they might get knocked out of shape by the hopping foot, but they were made of sterner stuff than I had anticipated and held out against the onslaught. This was the really scary part. Along two sides of the outer border there was barely a quarter of an inch to a fraying raw edge. The material was too fragile to even consider adding a strip of new fabric with a seam before quilting. 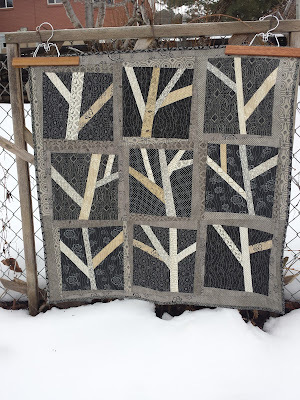 The solution was to lay a strip of fabric over the frayed edge after I had quilted the embroidered panel, sew it in place, and then quilt the added strip. The new fabric was a linen effect cotton in a slightly more muted shade of red than the centre. Before laying it in place I hemmed it with my oldest machine, the Willcox and Gibbs which dates from 1888. I used a variegated thread, and was really pleased with the effect given by the multi-coloured line of chain stitch. Next I quilted the plain red border, and finished off with dark green binding. For all the straightforward straight stitching, I used my 1916 Singer 99K so it could sew its way into the New Year and celebrate its centenary. The finished wall hanging measures 30 x 32 inches and has turned out better than I had dared hope. 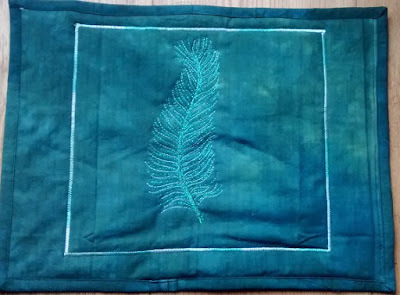 I am delighted that all the beautiful embroidery can be seen and appreciated, and all the hours spent stitching by the mystery embroideress have not gone to waste. ...like grotesque cartoon characters, enough to give little children nightmares. Rot, say I. No one over the age of two and a half could possibly be scared of a design that is so obviously based on my scissors. Update - Well my sister-in-law didn't like this wall hanging, but her brother certainly did! He now has it proudly displayed in his house in Baltimore. 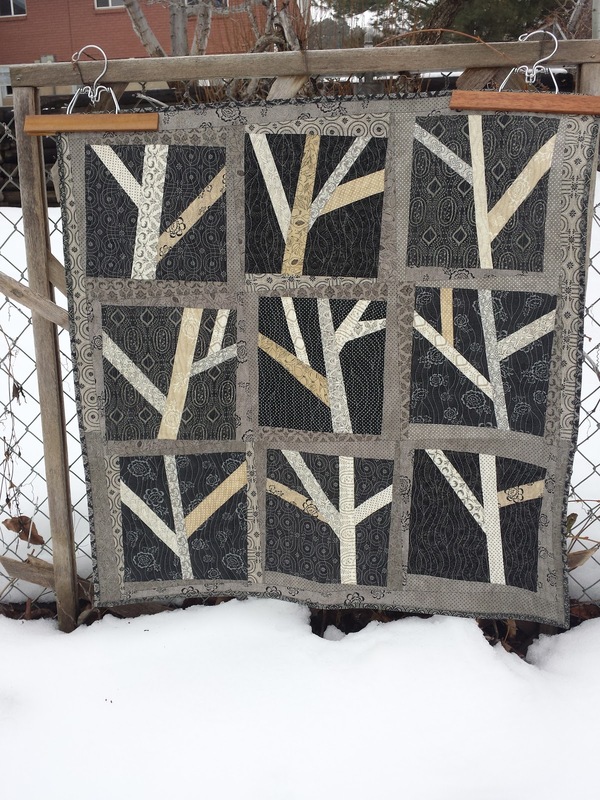 The project in Week 75 that really caught my eye was Em's winter trees quilt, beautifully displayed outside in the snow. If you haven't seen her blog post yet, nip over now and see more photos. This Singer 99K is the machine that I have been using for all my basic straight stitch sewing for the last month. It is an earlier version of the 99K, and there are a few differences between it and the 1927 99K that I am especially fond of. The serial number pinpoints the date of manufacture to the first half of 1916. German machines had been very popular before the First World War, but imports had stopped. Singer made sure that nobody made any mistake as to where their machines were manufactured. By 1918 it seems they thought that people had got the message, but still stamped the machines on the underneath. The tension discs are much smaller than on the later 99Ks. These decals are on the back of the pillar, rather than on the inside. The needle bar is very slender, much thinner than the presser bar. The face plate has a different floral design to that on the 1927 machine. Much as I enjoy playing spot the difference, the stitch produced by this machine is every bit as good as the stitch from my other 99K. I am looking forward to giving this machine plenty of use during its centenary year. This weather vane is on stables near my brother's house. Welcome to Suzan Almond, the latest follower - thank you for joining! Ever the perfectionist, I am trying to settle on the ideal size for a tea cosy to fit either a large or a small teapot. This is the near-identical twin of the cosy I made before Christmas. I can tell which is which at a glance because the binding is different. I have adjusted the size a little and drawn round a different plate for the curves at the top. My aim is to prevent too much of a draught at the bottom. Once the big fat blue teapot is under it the whole cosy bulges, which creates a gap. Now it lifts no higher than the height of a saucer, so I shouldn't worry about the pot losing too much heat. My other project over the Christmas holidays was this mystery UFO. A piece of hand embroidery done by I know not who I know not when should soon be taking on a new lease of life as a wall hanging. Today's special mention goes to Andrée, who kept on practising and came up with this lovely variation on the paisley design. If you haven't seen her blog post yet, nip over now and see more photos.